What is the one thing that 95% of the population can improve on ? If you said POSTURE then you are absolutely correct. A good posture will make you stronger, more energised and, best of all, it will make you look instantly slimmer. The theme for this week is therefore exactly that: Posture. The workout that is added for this week had a special focus on exercises that will strengthen the back, work on the glutes and stretching out the muscles that make us hunch forward. Don’t forget to look in your nutrition and happiness sections below as well as each of us will help you with little steps you can take to improve your wellness. This is the week we are really start to implement some changes because it is not enough to simply say that you want to get fitter or lose some weight. In order to make a change in your life, you will have to connect your goals to your emotions. What is it that really drives you ? Ask yourself: What is the leverage that you have on yourself to keep you motivated when the going gets tough? It has been said that in the end we are all driven by the fundamental need to avoid pain and to gain pleasure. If you haven’t been sticking to your health resolutions until now it’s because you have associated exercise with pain. We will do far more to avoid pain than we will to gain pleasure. Until you change this connection you will always be struggling to stick to any exercise routine. So how do you change this? Ask yourself this…. What are the consequences if you don’t change your unhealthy habits ? I hope you realize that this is not a pretty picture …Is the pain of seeing a future unhealthy you bigger than the pain of going to the gym right now? If it is than you will take action now. Lets say you spend another year living the way you do now . Visualize yourself looking in the mirror a year from now. Close your eyes and visualize what you see….Take a minute to do this….. How does this make you feel? Do you feel unattractive, uncomfortable?. Maybe you feel insecure or depressed? Now ask yourself is this pain worse than the pain of exercising for 45 minutes? Each time you’ll find it hard to motivate yourself, try to visualize yourself what you would look like if you stopped exercising. Now let’s do it again only this time, do the opposite. What would you look like after a year of exercising and healthy living? Again, try to really visualize this. Imagine how great you would look ! We would like to challenge you to do the following exercise. Pick up a piece of paper and …..write down exactly what you want to see in the mirror a year from now. Try to be as specific as possible. Write down the size jeans you want to wear, the weight you want to be, the feelings you will have. On the back of this paper you…… write down why you are absolutely committed to achieve this goal. Get some sticky tape and stick this paper on your mirror or in your car. You have now set yourself some goals. and….We have added more exercise routines this week. You can find the workout by signing in to the member section of our website. We understand that even the most basic exercises can be a challenge if you haven’t exercised for a long time but give it a try nonetheless. If you struggle with an exercise you can contact us using the message center. Continue with your walking, trying to reach 10.000 steps a day and add 2 workouts this week to build up your strength. So in total you should have 7 walking days and 2 workout days this week. By now we have a good idea what we are eating and you probably found some foods in your plan that weren’t so good. You can log into your account by visiting the member section of our website. There is a link above the sign up form that you can use. It’s an easy to use digital portal that provides you with the recipes, tools and information you need, to embrace lifestyle change and enjoy better health. Doing this Wellness Challenge shows that you are interested in your health, but how much time are we also devoting to our mental health. For example, what daily activities are you doing to reduce stress? Are you aware of what causes your stress levels to rise to the point of eruption? Having a strong mindset and being aware of these things can help you to achieve your personal goals faster. 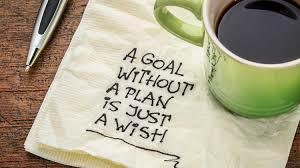 Goals are an excellent way to stay on track and achieve what we want from our lives. Using an analogy: “There are no short cuts. No elevator to the top of the building. We have to take the stairs. To reach the top, we need to take one step at a time. We continue to climb until we reach the first floor, then more steps to the second floor, until floor-by-floor, we make it to the top. Set goals that make you happy and that are right for you. A goal is a tool to help you move your life in the direction you want it to go. Goals help you gain clarity on what you truly want from life. So, your goal for this week is to write down your goal as specific as possible.